Thursday, October 4, 2012 - Monsanto has always maintained that glyphosate is quickly biodegraded in the soil. However, USDA microbiologist Bob Kremer has warned that, "After 16 years of Roundup Ready crops, particularly corn and soybeans, researchers are now detecting glyphosate in the soil and run off water in the Midwest of the US." Other studies have shown that glyphosate destroys or inhibits the growth of soil bacteria that are involved in degrading toxic soil additives and that it takes several micro-organisms to break down the complex molecules of glyphosate. When glyphosate exposed crops die, the toxin is released from plant tissue and remains in the soil where it can be transferred to the living roots of subsequent crops. This disruption of the soil microbiology weakens plant growth and yield potential. [The West Australian 20 Sept 2012 by Jo Fulwood] -- A US Department of Agriculture (USDA) scientist visiting Australia has warned that, "After 16 years of Roundup Ready crops, particularly corn and soybeans, researchers are now detecting glyphosate in the soil and run off water in the Midwest of the US," USDA microbiologist Bob Kremer said. 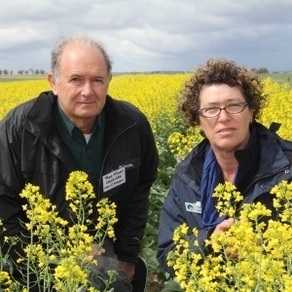 "Residual glyphosate has only just been detected in the last year so it’s really difficult to extrapolate that that’s going to affect future crops, but there could be a potential," he said. Dr Kremer presented the findings of the study ‘Glyphosate relationship with soil biology in glyphosate resistance crops’ to farmers at the WANTFA spring field day in Cunderdin [Western Australia] last week. He said it was very important for farmers to maintain a diverse biological system to keep a full nutrient cycle going for plant uptake. "We do know that it takes several micro-organisms to break down the complex molecules of glyphosate," he said. "There are instances where glyphosate is used for vegetation management in systems such as orchards, where they control the vegetation in the alleys with glyphosate and then it has been determined that, in time, as that vegetation dies, the glyphosate releases from the plants and it may remain in the soil and it can be transferred to the living roots of the orchard crops." Dr Kremer said it had been related to reduced productivity in those trees, which included lower yields. "Anything that disrupts the microbiology of the soil could see an impact on plant growth and yield potential," he said. Dr Kremer said researchers had detected an increase in the fungus fusarium on the roots of plants that had been recently sprayed with glyphosate. "So far we haven’t seen that develop into a plant disease but the potential is there," he said.